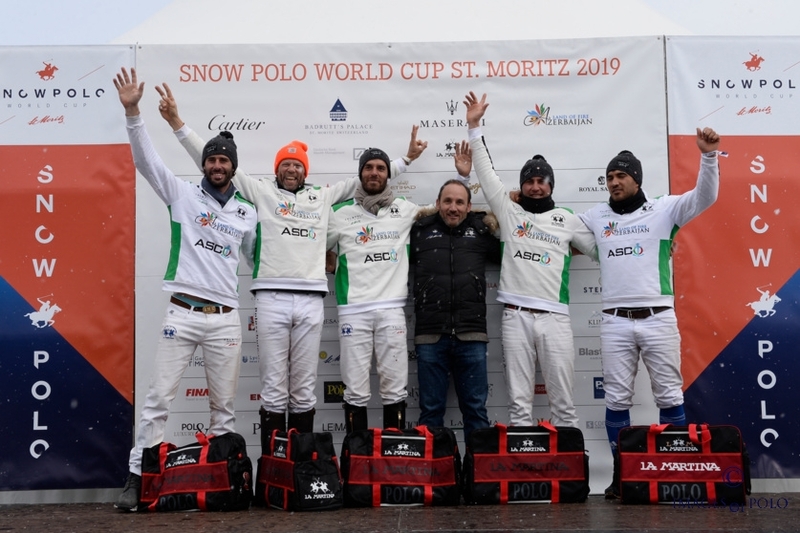 Five-time winner of the tournament and ‘Godfather of Snow Polo’ Reto Gaudenzi and his 250 strong team, has once again delivered the greatest snow polo event on earth. We were promised thrilling polo in the birthplace of the sport in this, the 35th year of the event and that is exactly what the record-breaking crowd (18’000 spectators) were given. 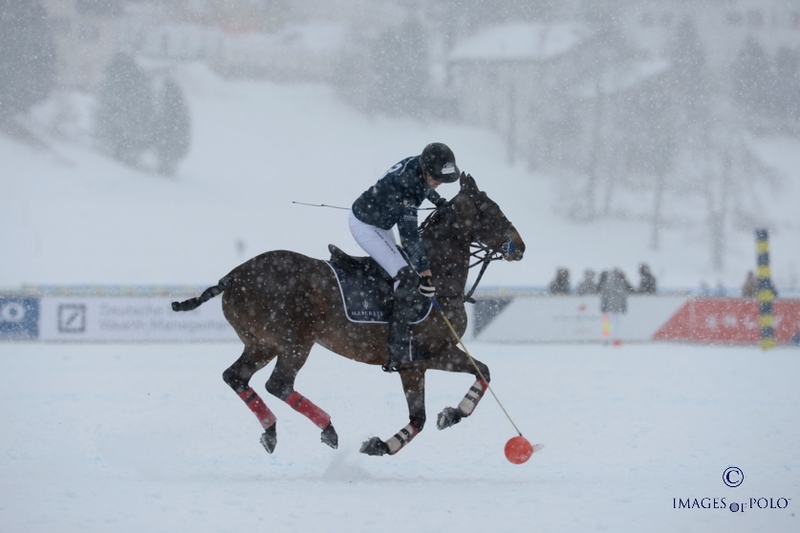 With the sun bathing the Engadin Valley and the ice frozen to the perfect depth, the best players and ponies in the world and the atmosphere electric with a snow polo frenzy, the final day of play burst into action. 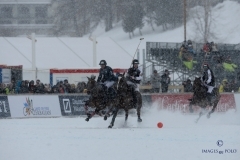 It was an epic battle which saw not only Badrutt’s Palace secure the top podium position for the first time in 35 years, but also Melissa Ganzi, Badrutt’s Team Captain, make history as the first lady player to win the tournament. 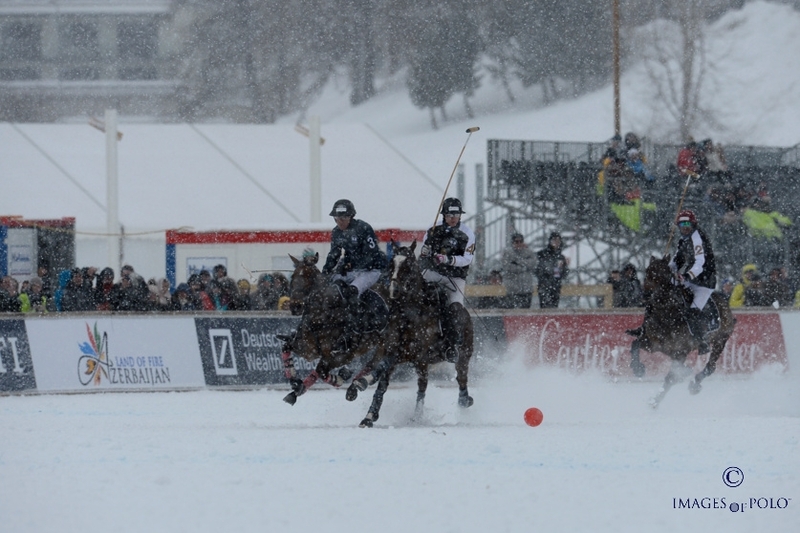 As the snow began to fall gently upon the spectators thronging around the arena and the packed grandstands, the battle began for the La Martina Cup Subsidiary Final with last year’s winners Team Cartier facing the exuberant Team Azerbaijan Land of Fire. 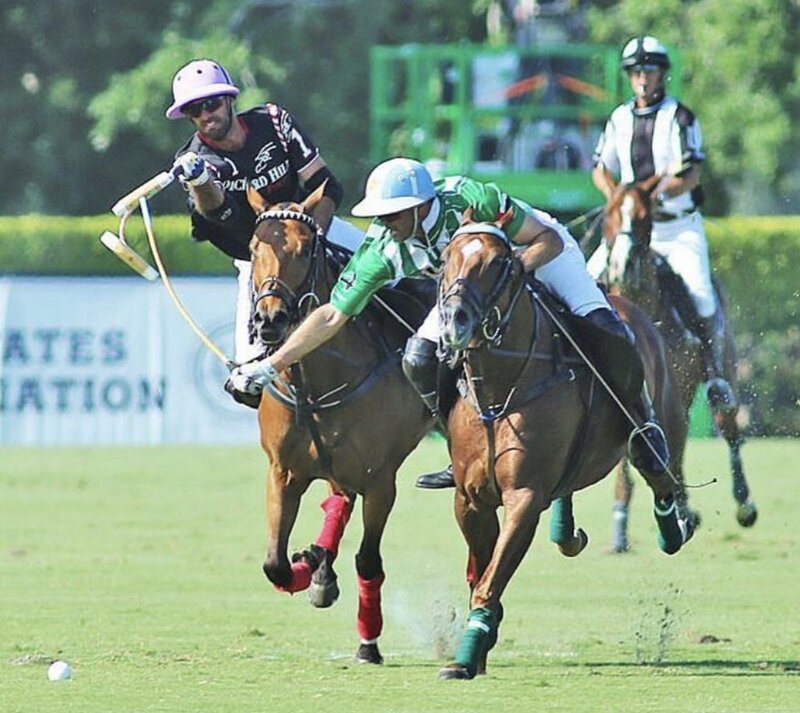 With the collective prowess of the father son duo of Marc and Team Captain, Grant Ganzi, alongside Engadin powerhouse Tito Gaudenzi and the poetry in motion that is 10 goal maestro Juan Martín Nero fresh from his 2018 Argentine Open win, aficionados were expecting an explosive performance from the Cartier shirts. Team Azerbaijan were the underdogs on paper having received a 2 goal advantage to start the match, but this handicap disadvantage was never in evidence as they performed cohesively as a team. Despite the injury to his ear yesterday, Adrian Laplacette Jr was back on fighting form working well alongside his three team mates. Commentator extraordinaire, Jan-Erik Franck ‘The Voice of Polo’ promised us that in polo “anything can happen”, and he was not wrong, as despite great play and teamwork, Cartier failed to score at all during the match, whilst their opponents found the posts three times to bring the final score to a surprising 5-0 defeat for Cartier at the hands of Team Azerbaijan Land of Fire. Despite his team’s loss, Juan Martín Nero was gracious in defeat, saying: “It is great to be back in St. Moritz. 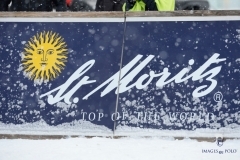 It is such a special tournament; the people, the snow, the great organisation. 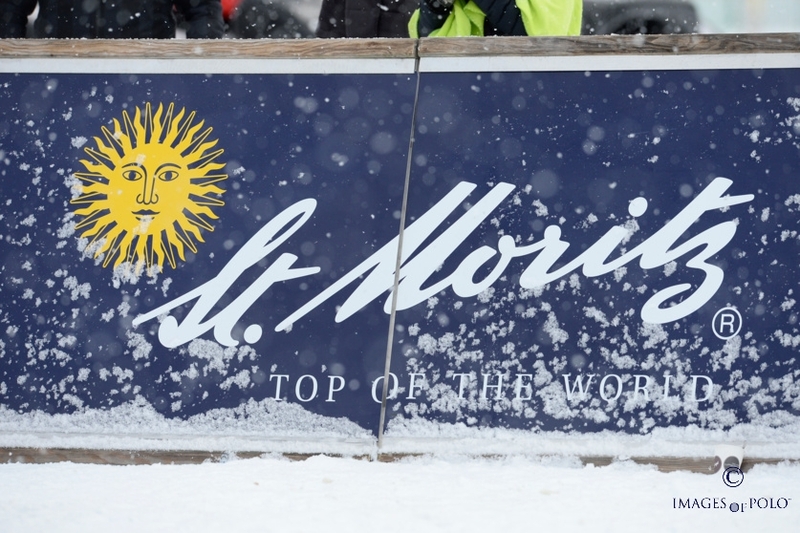 Everything is fantastic and I can’t wait until next time!”. The Final for the Cartier Trophy was a true snow polo epic as Melissa Ganzi’s Badrutt’s Palace faced up to the might of Maserati. 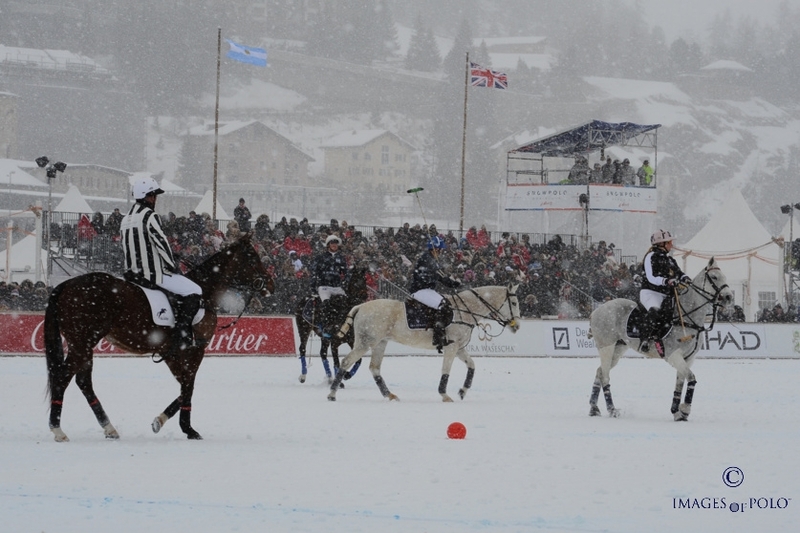 The teams were equally matched in handicap and this was reflected as neither team found the posts for the first half of the initial chukka. 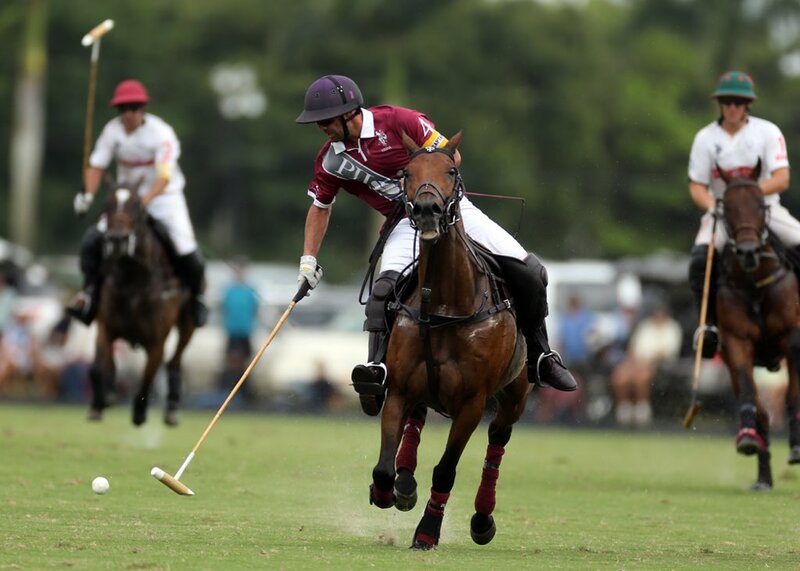 However, the goal scoring maestro Alejandro Novillo Astada soon swung into action putting two goals on the scoreboard in quick succession so his team was in the lead 2-0 at the end of the first chukka. 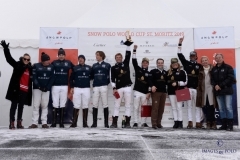 He was unstoppable, notching up goal after goal and neutralising the best efforts of the combative advances of the Brit duo of seven times winner Chris Hyde and Max Charlton for Maserati. In a fast and furious game, it was thrills and spills aplenty as the passion took hold and players battled each other for victory. 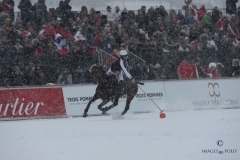 Novillo Astrada was caught by Charlton’s stick and fell to the ground. 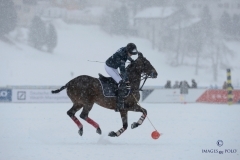 Soon back up he was undaunted, coolly converting the resulting penalty at the beginning of the third chukka. 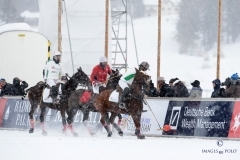 The drama continued as Bigatti’s horse came down after a ride off during a frenetic passage of play. 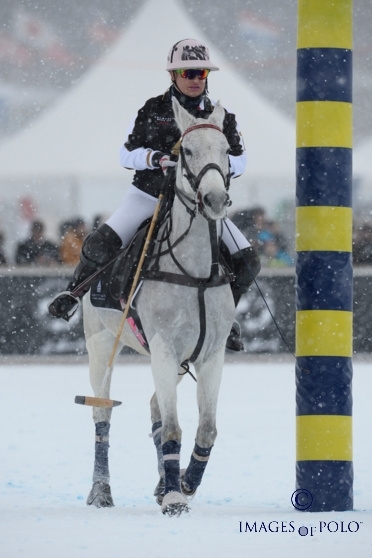 ‘The Prof’ Hyde was also soon off his horse, a nerve injury sustained in yesterday’s match flaring up and meaning he was unable to continue. Luckily there was more than one Hyde in St. Moritz as his 4 goal son Jack put on his boots and came out competently in his father’s place, despite having never played on snow before. 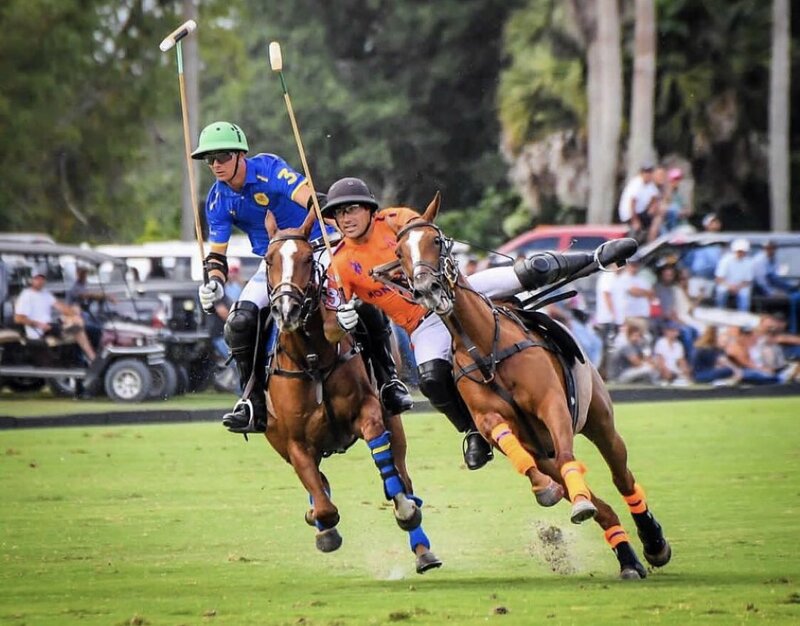 The start of the fourth chukka saw yet another goal from the goal scoring tsunami Novillo Astrada for Badrutt’s Palace and so the result seemed inevitable as the score was 7-3 with just minutes left on the clock. However, Charlton was not ready to give up and was firmly on the attack, resulting in Peluso being struck on the hand and falling to the ground in pain. 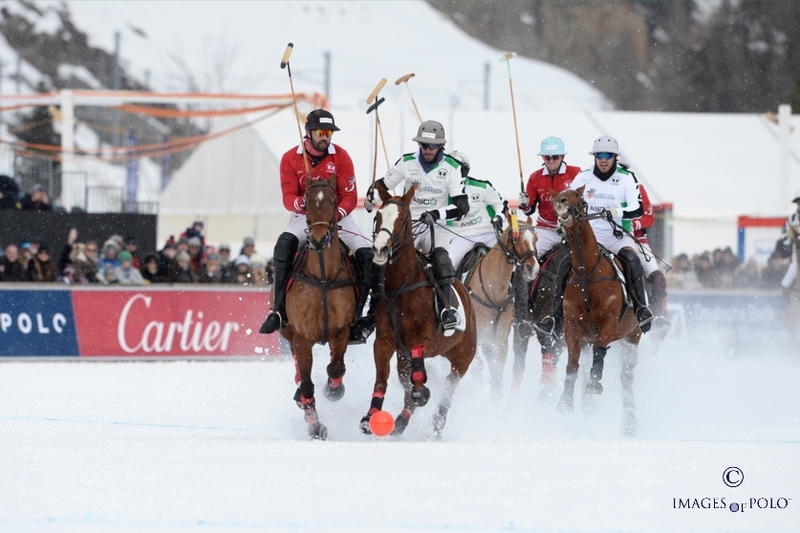 Despite the inevitability of defeat, Maserati remained on the offensive until the last seconds of play, but it was all too little too late, and history was made as Badrutt’s Palace secured the trophy for the first time in the history of the tournament. 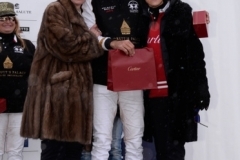 The Cartier Trophy was presented by Mrs Laurence Bourgeois, Cartier Managing Director (Switzerland) and Mrs Kaethy Dobers, the Boutique Director of Cartier St. Moritz. 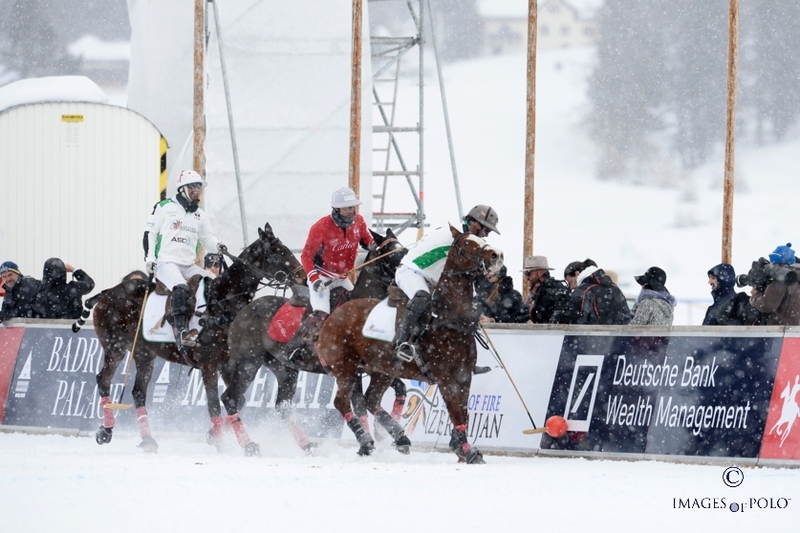 The best Playing Patron, presented by Peter Schmid, Head of Wealth Management Northern and Central Europe Deutsche Bank, was awarded to Melissa Ganzi. 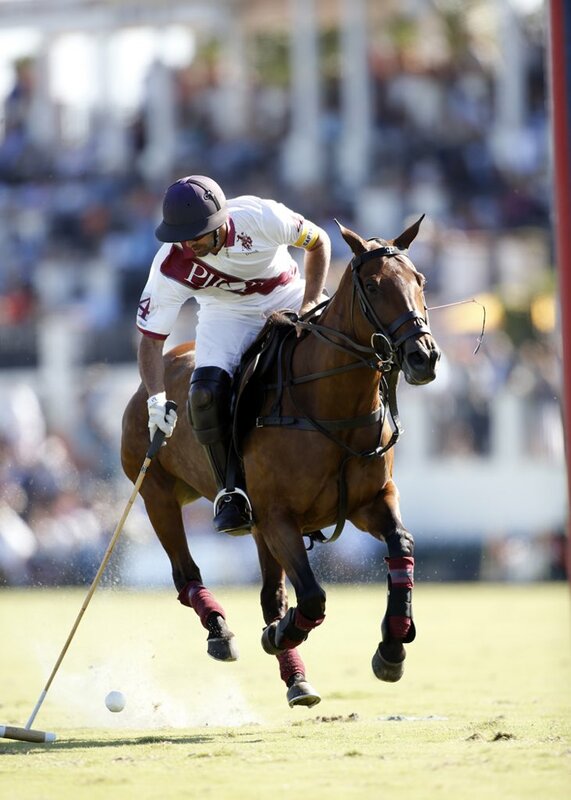 The Most Valuable Player was awarded to Alejandro Novillo Astrada, whilst the Polo Times Best Playing Pony was awarded to Pantera played by Alejando Novillo Astrada in the fourth chukka. 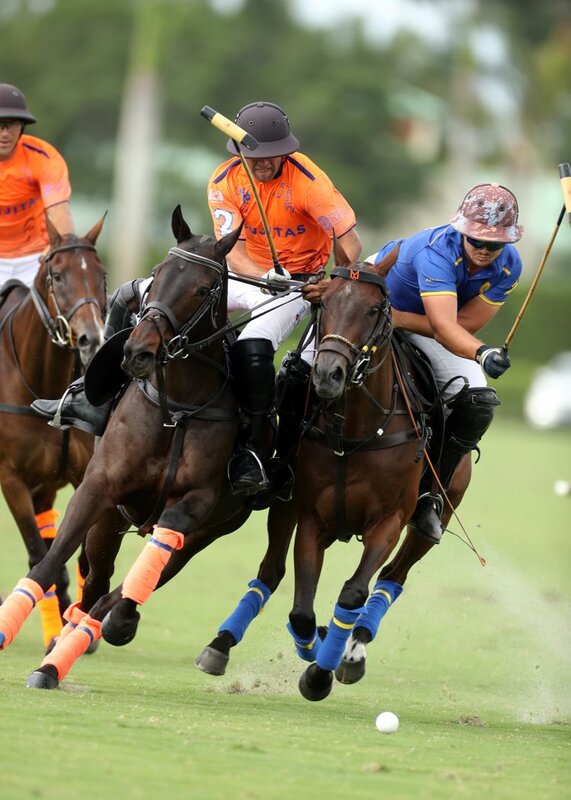 None of the thousands of spectators wanted the three days of thrilling polo action to end. 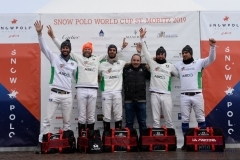 The Snow Polo World Cup St. Moritz 2019 had once again been a triumph at every level and a credit to Reto Gaudenzi and his team. 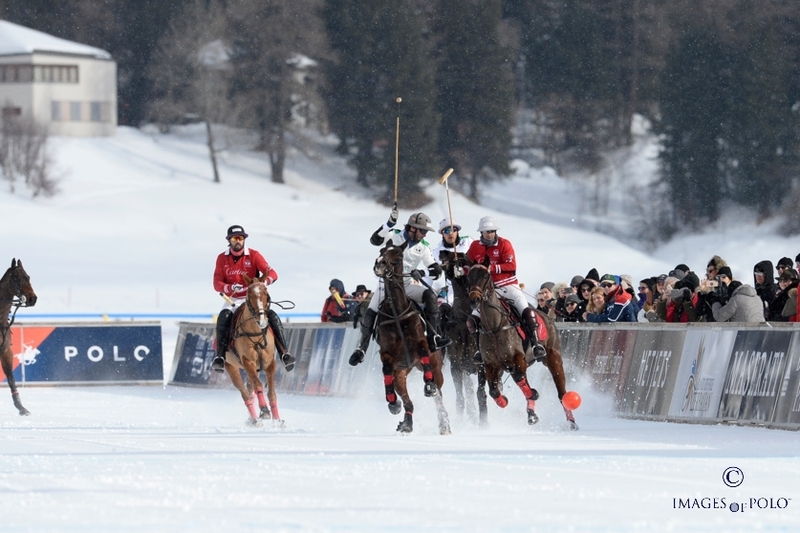 The beautiful resort of St. Moritz had surpassed itself again – alive with sun, hospitality and thrilling polo. 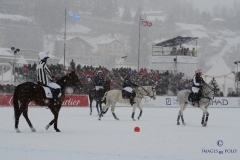 Make a note now of The Snow Polo World Cup St. Moritz 2020 on 24, 25 & 26 January 2020!